Snow Peak Ti-Mini Solo Combo 2.0 Cookset. Snow Peak's new and improved Titanium Mini Solo is bigger and badder. With a complimenting cup that can hold almost twice the volume of the original Mini Solo, a more streamlined handle design, a slightly larger pot, and a new silicone tab that can be grabbed without a hot pad. As with our previous Mini Solo, the pot is designed to hold two 110-g fuel canisters or a GigaPower stove and a 110-g fuel canister. New larger cup and pot, and streamlined handle design. The cup is now large enough to store a canister of GP-110G. New silicone handle that allows lid removal while in use. Spacing allows for inserting the new Titanium Mini Fork. Stacking and mesh bag allow for convenient storage. 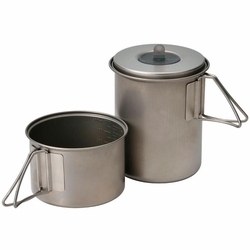 The Mini Solo can store either two GP-110G canisters or a canister and a stove. Dimensions:	Pot: D 4.25" H 5.1" Cup: D 4.3", H 2.8"